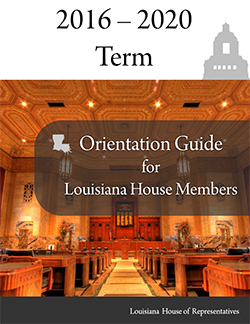 An introduction to the legislative branch of state government revised quadrennially and intended to serve as background information for newly elected members of the Louisiana House of Representatives. This new edition of the guide discusses House procedure as it reviews the essentials of the legislative process. It describes the staff services and information sources available to House members, including technology that gives the public easier and greater access to the legislative process and provides vital sources of information to aid House members in their roles as lawmakers and as problem solvers for their constituents. We hope that this guide demonstrates the many ways in which the entire staff of the House can ably assist each of you - and how much we want to do so. Entrance to the House Chamber from Memorial Hall, courtesy of the House Communications Office, Louisiana House of Representatives.